Most of the time artists, bands, performers generally visit the Buffalo/Niagara Falls area when a major tour is out on the road. However every once in a while, for one reason or another they do not. So when this summer’s Journey tour was announced I noticed the closest venue they would play is CMAC Performing Arts Center in Canadaigua. The drive is a tad over an hour but very well worth it. Formerly known as the Finger Lakes PAC, the venue was completely renovated and reopened for the 2007 summer season and has since hosted several great concerts. This one was no exception. Opening the show promptly at 7pm was the Canadian rock band Loverboy. The band took the stage to “Queen Of The Broken Hearts” off their 1983 album Keep It Up. The band still consists of vocalist Mike Reno, guitarist Paul Dean, keyboardist Doug Johnson. The rhythm section has Matt Frenette on drums and Ken “Spider” Sinnaeve on bass. The band tore through a quick 35-minute set that featured stalwart tracks “Lovin’ Every Minute Of It” and When It’s Over”. The crowd really perked up when the band ripped into the song that first got them noticed “Turn Me Loose” back in 1980. Ending with the anthemic “Working For The Weekend” the band did their job setting up the crowd for Pat Benatar who was up next. The act is now billed as Pat Benatar featuring Nick Giraldo although Nick has been with her from the start. He has also been her husband since 1982 and for trivia buffs is the first guitarist to ever appear on MTV in a music video. Benatar’s video for “You Better Run” was the second video ever shown on the once mighty music station. During “We Belong” Pat stated “This is the part of the show where we sit down cause we’re old.” Benatar seemed to be in fine voice throughout her 50-minute set that saw her get the crowd on their feet during her classic “Hit Me With Your Best Shot”. Her encore ended with her first ever US Top 40 hit “Heartbreaker”. “Heartbreaker” also had a twist to it as she added some of Johnny Cash’s “Ring Of Fire” to the middle of it. Overall a solid performance by Benatar and her band set the stage up nicely for the headliners Journey. 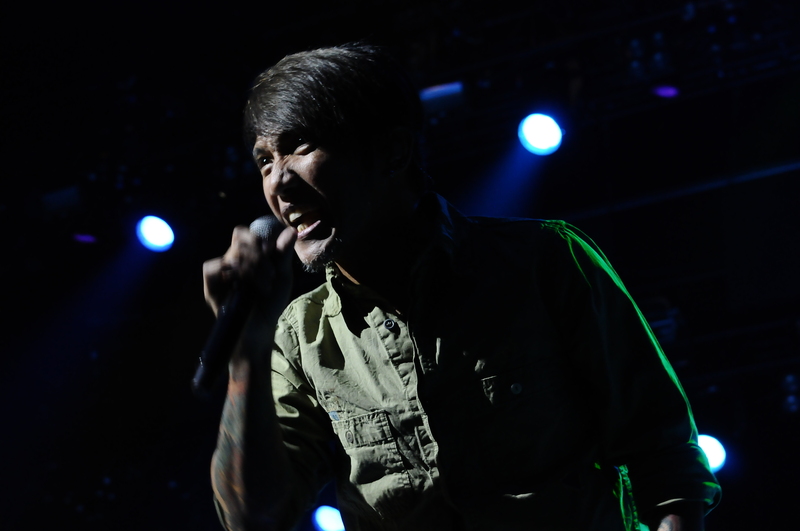 It is hard to believe current Journey singer Arnel Pineda has been with the band now for five years. He has come into his own as evidenced by his vocal performances on Eclipse and Revelation as well as any recent tours. Casual fans still clamor for former vocalist Steve Perry to reunite with the band one last time but as this reviewer sees it, there is no need as Journey has finally found their man. The bridge from Perry to Pineda was filled in by Stege Augeri (1998-2006) and Jeff Scott Soto (2006-2007). Augeri and Soto both capable singers did a good job filling in but Pineda has grabbed the role and has given Journey the stability it needed to continue forward. While this years tour is an extension of the Eclipse tour from last year, surprisingly the band chose to not perform any tracks from it on this particular evening. In fact the band had just recently changed the set list up from show to show a tad to keep the show fresh. The set featured the songs most would expect to hear like the power ballads “Faithfully” (kinda early in the set than normal) and “Open Arms”. Rockers such as “Any Way You Want It”, “Ask The Lonely” and the crunching “Stone In Love”. What Journey concert would be complete without “Wheel In The Sky”, “Don’t Stop Believin” and “Separate Ways”? The show had something for everyone. The diehards were treated to rare plays of “Send Her My Love”, “La Do Da” which ran into the Jonathan Cain lead vocal of “Anytime”. Another surprise was “Never Walk Away” off of Revelation was brought back in this year’s set. Guitarist Neal Schon, bassist Ross Valory and keyboardist, guitarist Cain are the mainstays of the band. Drummer Deen Castronovo has been with the band since 1998 and occasionally performs a lead vocal or two but it was not to be on this night. These type of packages seem to bring fans out, but the performance is what keeps them coming back. In Journey’s case, they do a great job catering to all the different types of fans they have. From casual fans to fanatics and everything in between, Journey also seems to bring the right bands to open for them. Let’s hope this trend continues on the next tour, whenever that may be. A Big Thank You to Shannon Struzik at Dixon Schwabl for her help in helping us review the show.